The days of going to the shopping mall are so 1990. Actually, thanks to online shopping, malls are a dying breed. Just like a shopping mall has choices upon choices, so do we when it comes to clothes shopping. Not only do we have specific merchants/brands, but also services. I am comparing two services that I have personally tried. 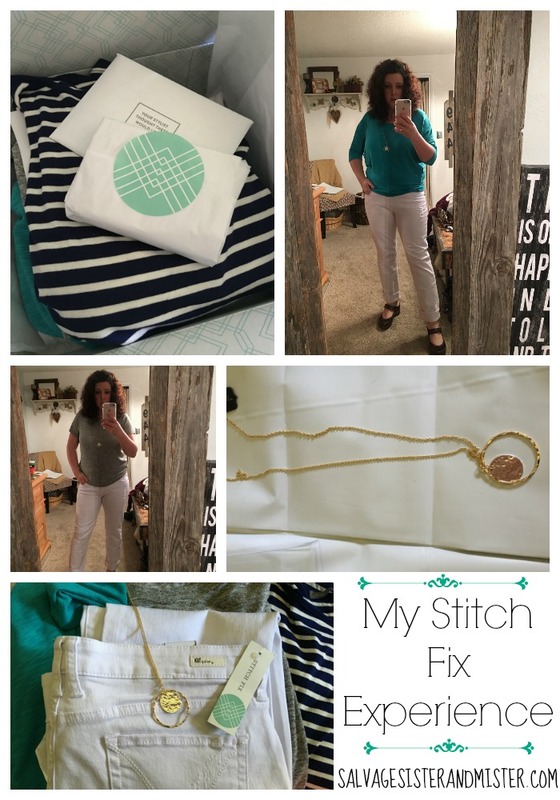 *I am an affiliate for Stitch Fix, and have added a free link to the ThredUP app to get started. 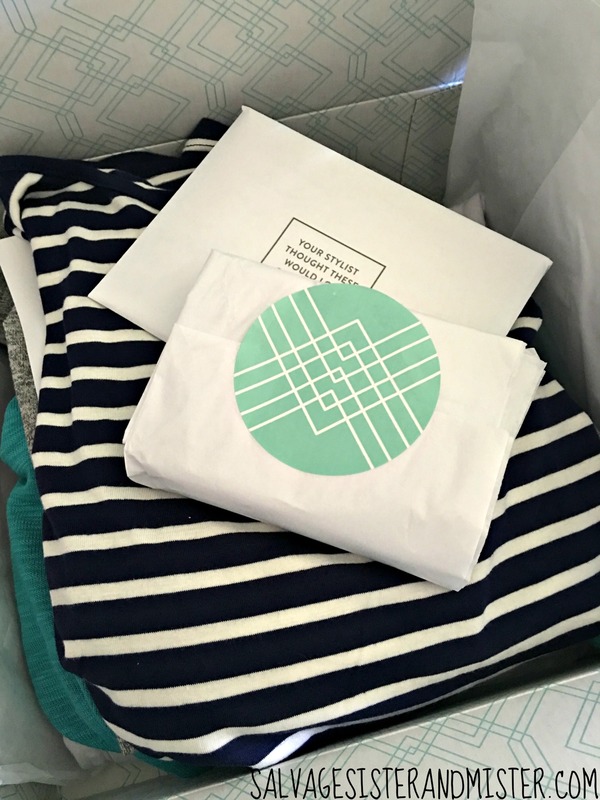 Stitch Fix is a personal styling service tailored to your taste, budget and lifestyle. You start with a personal style quiz…fill out info on your style, budget, sizes, even linking to a Pinterest Fashion Board for your personal stylist to send you items they think will fit your body type and preferences. Five items (clothing and accessories) arrive nicely packaged, with info on what you received, prices, and a suggested styles card so you can envision your pieces in different ways. If you purchase all the items, you receive a 25% discount off the box. There’s a $20 styling fee which you can apply toward your final order which makes it pretty risk free. You can choose how often you want a shipment. They have exclusive and popular brands. I have received two shipments and I loved most all of the items in each box. I do enjoy shopping but boy it was nice for someone else to do it and get it right. Because they have my measurements the sizing was right on (for the most part). I have heard of others who don’t always like their “fix” shipments. I personally think this might be tied to how much information the stylist has to work with. This is no time to lie about your sizes and make sure you really know what style you like. You can say you love dresses, but if you never wear them, that’s not going to help anyone. The experience is pretty far from my typical thrift store shopping so it was a major treat and they make it feel special. I am also a pretty casual person, so the clothes are high end for my DIY life, but the ones I received were very nice quality (soft). The costs are too high for my particular budget but if it fit in my budget I would do it on a regular basis for sure! If you are pressed for time, but not finances, I think this is a wonderful option. The initial profile takes a few minutes, but after that it’s very little time invested. I think this is also good for anyone who might be challenged in styling and those who don’t like to shop. ThredUp is the world’s largest online fashion resale shop. Since they company buys and sells, which I have done each, I am going to talk about the buying part today. I will discuss the selling in another post. 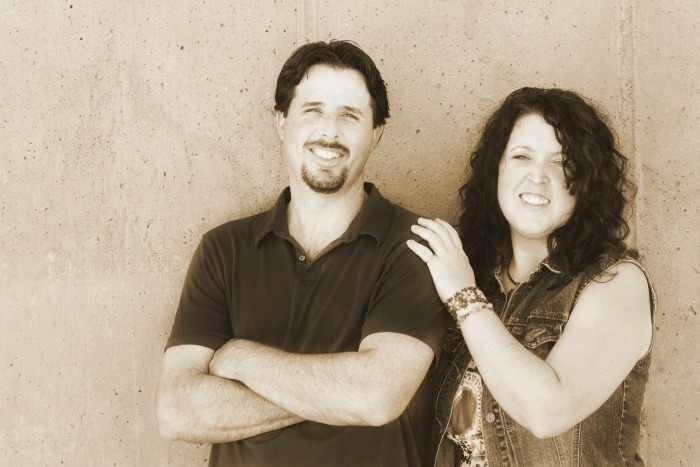 You go to their site and shop as you would with any other major online retailor. Since they only accept major brands, I found searching by a brand to be the easiest way to look for items. I had a really nice discount for my first purchase and it came with free shipping. When I received my order it was in a regular box but it did include a note from the company, which I thought was a nice touch. 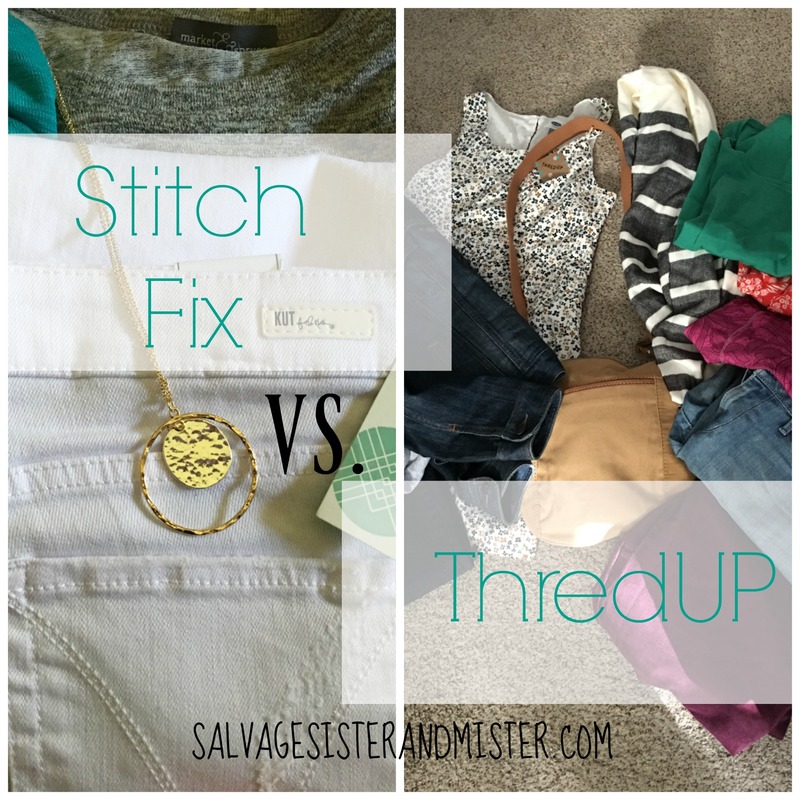 As a thrift store shopper, I was really excited to try ThredUP. I am partial to used clothing not only for the budget side of things but also the waste issue. Because I am not necessarily a brand shopper, I found it a bit difficult, and time consuming, to find items I thought I would want to try. When I received the box, it wasn’t a surprise like with Stitch Fix. I knew what I had ordered. This can be a good or bad thing depending on your preferences. It was in a regular brown box, but the wrapping inside was nice. For the same price as Stitch Fix, I got three times as much. One item had a couple of wrappers in the pants (which I am sure is not a common experience). Sizing. I don’t know the brands enough to know if they run small or large so I had several items not fit quite right. One item, that didn’t fit, was on sale so I couldn’t return it. For the items I did return, I received a credit since I know I will use the service again. It was super easy to return the items with the shipping label that was provided. If you are on a budget this is a great way to get brand name items inexpensively. I would also recommend for anyone who is concerned with reducing waste. Again, knowing your brands helps, in my opinion. Have you tried either service/company? Cute! I think I’d like to try ThredUP. sometimes it’s just so hard for me with sizes though and that’s what holds me back. HOWEVER, if I’m looking for something in particular and I know what size works, I think I’d order it. At the same time, I could probably re-sell it locally. If money wasn’t an option I’d probably totally try Stitch fix too. Kirstin recently posted…What world do you live in? If you know the maker and how sizes run, thred up can be a great option! Hi! Can you give me a little more info, what kind of prices were each item in the Stitch Fix box? Do they send super basic items or do you feel like they are good at sticking to the styles you select? Thanks so much! Hi Jessica, So the prices are kind of hard because they give you discounts depending on how many pieces you buy. You get about 7 items (if I remember correctly). The box total, if I kept everything, would have been around $200. In regards to style, you pick out outfits that you like and create a style board. The more info you give the better. Take your time to do all the work initially so you get the styles you want and don’t have to send stuff back. Here’s what I loved- the ease, the outfits were dead on me, the fit and quality was there. Here’s what I didn’t like – The cost. And honestly, I just prefer reusing clothes instead of new, but I loved the two boxes I did get to try it. Hey! ThredUp has Goody Boxes too now. So it is as exciting as getting a Stitch Fix. I just got both boxes in the mail. 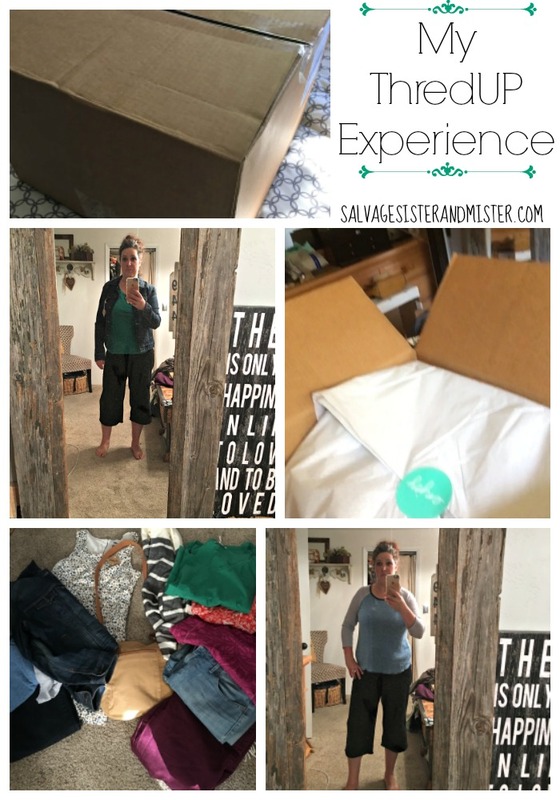 I was a little disappointed about my Stitch Fix, the clothes did not quite fit, only 5 pieces to choose from and it was a little pricey; however, I absolutely loved my Goody Box from ThredUp. They match my style, had a variety of clothes to choose from (10-15 piece statements), and all of them were major brands. I could buy all of the things in the ThredUp Goodie box and with the same amount of money just get two things from my Stitch Fix box. Amazing right! Well worth it experience. I will definitely be trying it again. Kari, I get their emails and didn’t even know this. Thanks for sharing that!!!!!!!!! !